Heh. Heh. So I left my new book out on the dinner table where it was likely to be discovered by young kids, and it was. 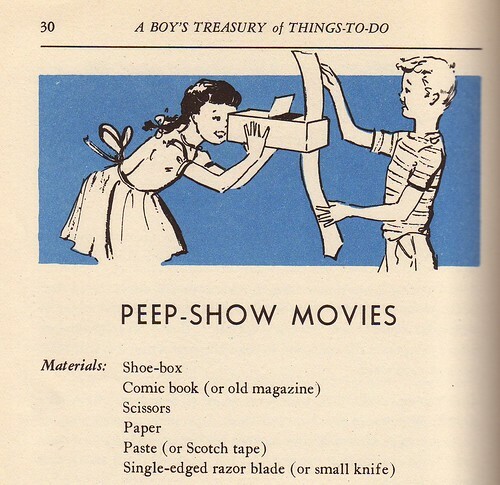 While I was busy getting dinner together, Maggie ran up to me with the Boy’s Treasury of Things-to-do clutched tightly in her hands. She was desperate to make a peep show movie. I told her she could if it didn’t require any help from me since my hands were pretty full at the time. From the sidelines it appeared quite easy to do, even if there were a number of steps. Maggie is turning nine soon and was able to complete the project mostly on her own. I think Bjørn, at almost-seven, would have needed a bit more grown-up help. 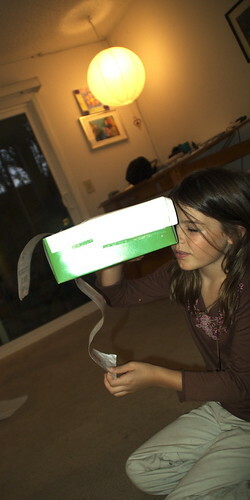 Cut slits about an inch from the end of a shoe box (lid and bottom) to thread your “movie”. Cut a skylight in the lid. Fold up to allow light down onto your images. Cut a long strip of paper the width of your slits. Draw lines at even intervals the height of your box so only one picture is displayed at a time. Draw your story starting at the bottom panel. You could also paste comics or pictures from old magazines. Maggie recruited her Dad to draw a series of single panel cartoons. When done thread your paper carefully through the two slits. Oh how fun!! Great job, Maggie!! I will have to watch for this book. I think Tyler would love it. We like to make fun little crafts!